Pra Somdej Prok Po Bodhi Tree Buddha Votive Tablet in Nuea Pong Nam Man Sai Rung Rainbow Powders from Luang Por Khom. Luang Por Khom of Wat Pai Rong Wua, was renowned for his preference to make amulets that are Buddha Images, much more than images of himself, or Deities of the Hindu Pantheon. 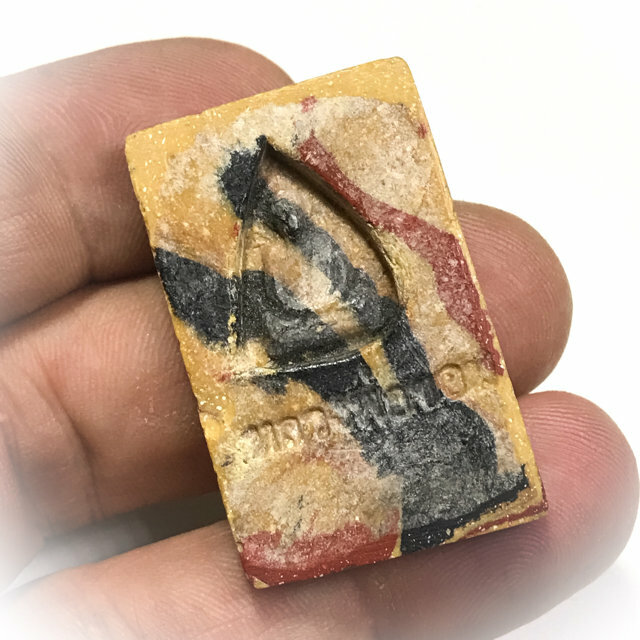 He always made his amulets in the most traditional methods of his Era, and would only rarely allow amulets to be made with his own image. Mostly he would like to make purely Buddha Images, and liked to make amulets in the ancient way of using baked clay. 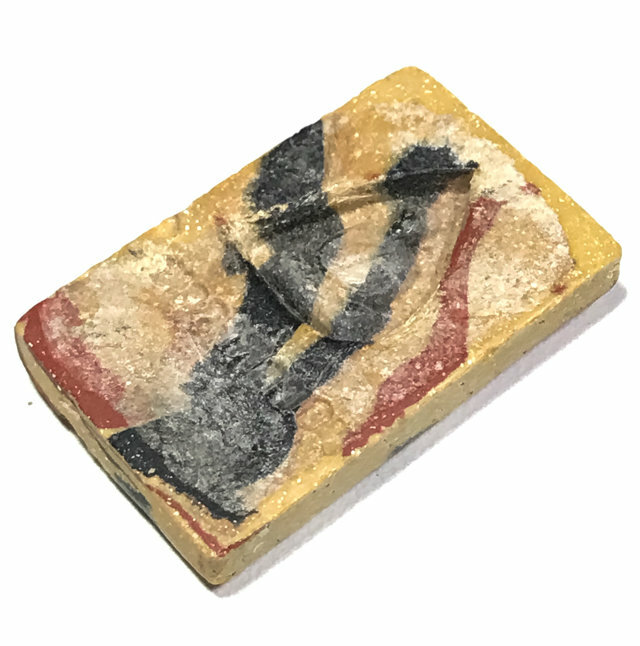 His amulets are renowned for Kong Grapan Chadtri, Klaew Klaad, and Maha Lap Serm Duang Magic, and are a very recommendable choice for those with lower budgets who seek Buddhist Amulets of antique class, with high sacred value. 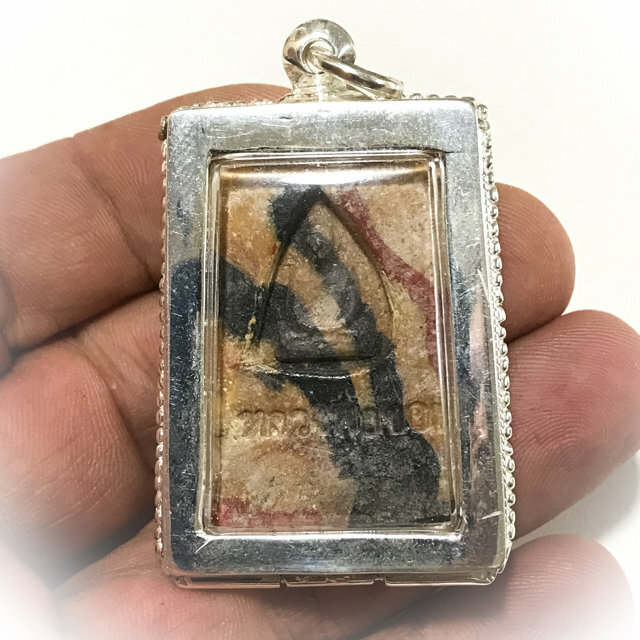 His amulets are very popular with those who prefer a purely Buddhist amulet, with no Black magick or Khmer Sorcery, for Buddhanussati Remembrance of the Buddhist practice. This exhibit comes already encased by us in silver casing with rhinestones, included in the price. Luang Por Khom's adherence to preserving the Buddha Sasana in its pure form by making almost exclusively images that reflect the existence of an Enlightened Being (The Buddha), has been seen on Earth in the Past. This is the direct applied method of preserving the existence of Buddhism into the Future, up to the Time where Arya Sri Maitreya, the Future Buddha's Time has arrived, 2500 years in the Future from Now. 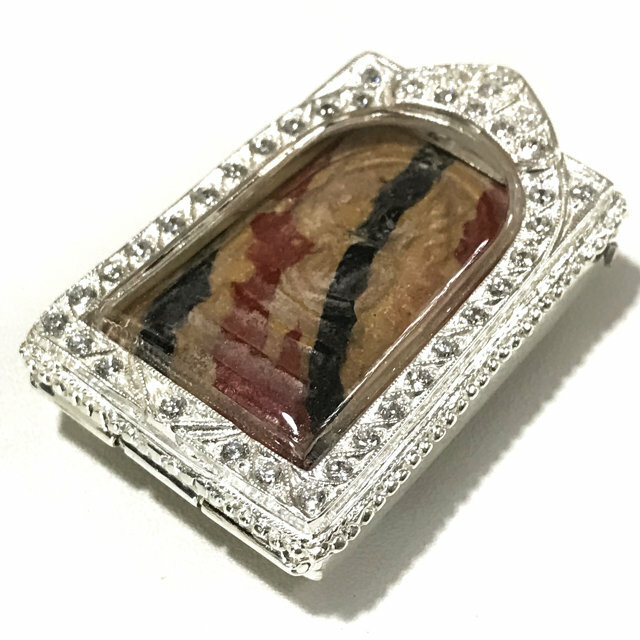 The amulet is made from Nuea Pong Phao Sai Rung Gae Nam Man (Baked sacred oily powders with rainbow effect), and bears the Pra Somdej Pra Pratan Image. 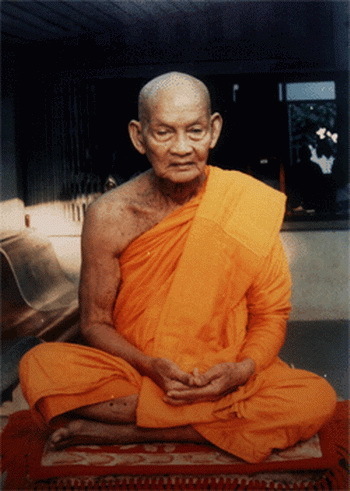 Luang Por Khom and his amulets came into favor some time in the early eighties, when he was also in his eighties, and were mostly snapped up by devotees shortly before and after his passing in 2533 BE (1990). 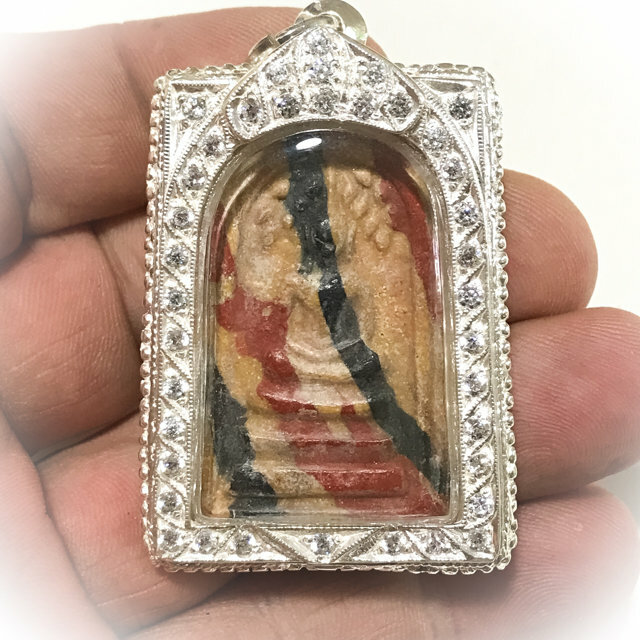 The amulets of Luang Por Khom are highly recommendable for their power and affordability, as well as for their highly Sacred status. 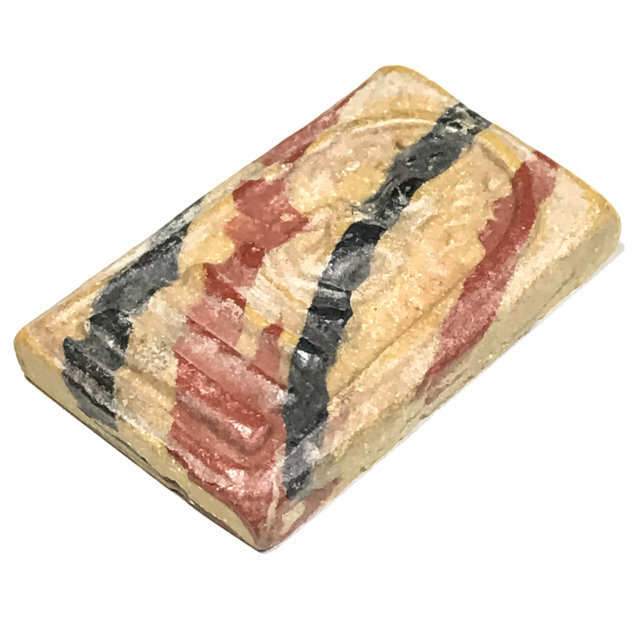 This particular rainbow colored oily herbal powder Pra Somdej Prok Po with Bodhi Leaf containing a Buddha in Samadhi posture on rear face, was released around 2505 BE, and is an immensely favored edition of Luang Por Khom's pantheon of amulets. Pure Buddhakhun Power, with the Blessings of the Buddha Sakyamuni in his monent of Enlightenment to Protect and Guide you, and remind you of your practice, to improve your diligence. 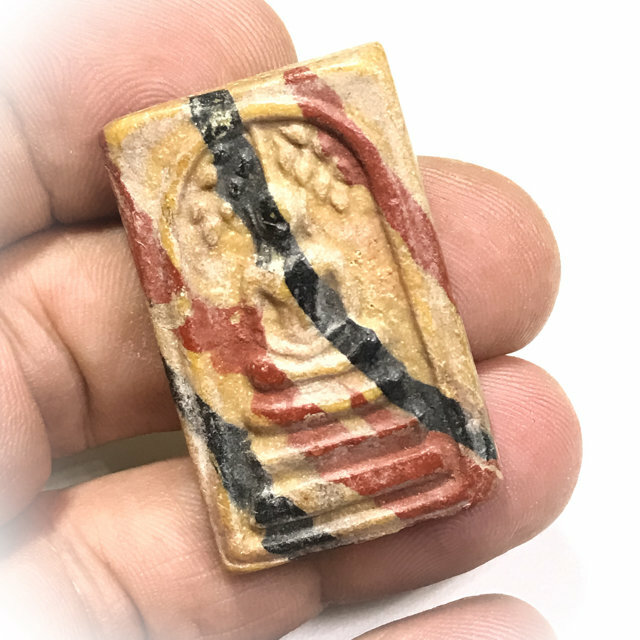 This is the perfect amulet for diligent meditative practice throughout the working day and the resting day, to keep us reminded of the merits of the Buddha, and his Enlightenment as a Human Being, which should Inspire Us to follow his Path, and his Good Example. 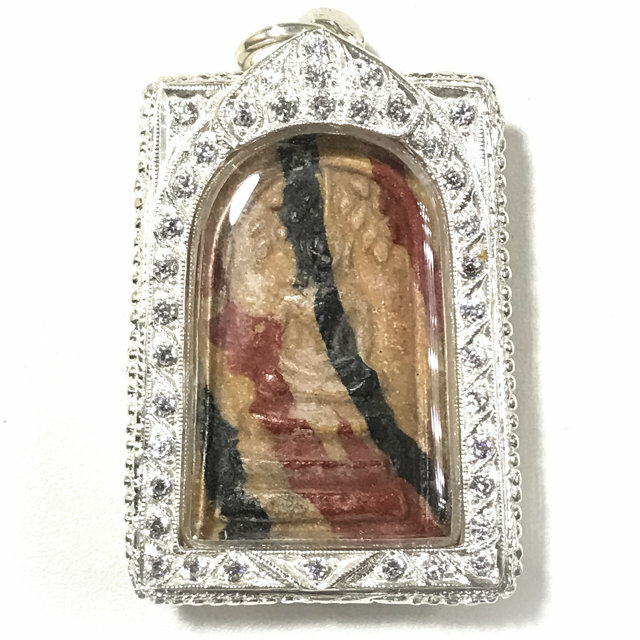 A truly sacred Ancient Amulet that can be added to anybody's Family Heirloom showcase, with Pride, and Reverence, as well as the surety of a great future, be it as far as the respect that has grown for the amulets of Luang Por Khom, as well as their steady increase in rarity, and speculative value, as time passes. Chant this Kata 3 times whenever you are about to place the chain over your head or put on the amulets, and also when you take them off. The Kata calls upon the power of the Buddha, Dhamma and Sangha to be with you and protect and Guide you.